Every creative person has reached a point where their creative juices run dry, and this just doesn’t happen once. Most times, it comes in the path to achieving your big break. The bane of every writer is writer's block. The same applies to artists. I experienced this block for the first time, and to make matters worse, I was in a contest, a comic art contest hosted by a popular Instagram art handle covering African artists. In this contest, I would have the rare opportunity to show my work to the entire African continent, if I was successful. But then it happened. One minute, I was developing characters and sketching away like I was a god. The next minute, a huge wall had popped up in my mind. Days crept by and I had not even come up with anything good enough to even be previewed, let alone be entered in the competition. I tried reading tips online, watching TV for inspiration, but nothing happened. I was starting to feel disappointment wash over me. Then, I decided to relax my brain cells. I spent the next three days away from my work table, I observed everything else that I had relegated to the background, took a walk to the popular Ikeja City Mall in Ikeja, Lagos State to grab some snacks. While there, I was walking towards the KFC stand when I saw little kids taking turns getting photographed against a particular wall. My inquisitive nature brought me closer, I found that there was a painting of wings on the wall, perfectly placed in such a way that kids could stand in front of it and get a photograph taken in such a way that it looked like they were flying. Like something out of a gun show, my creative juices started firing again. Goodbye, artist's block! In fact, goodbye lunch! I rushed home, took out my drawing pad and got to work. 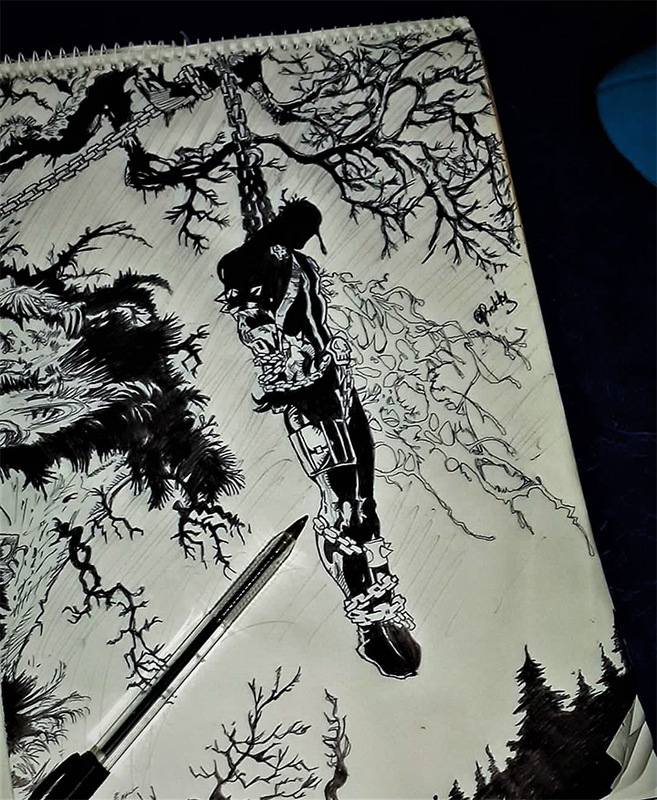 I came out with a very lovely comic design about a black superhero totally inspired by what I had seen at the mall, and even though I didn’t eventually win the grand prize for the competition, my work was still was among the top entries out of the thousands posted by various artists across the continent. A sketch of the image I entered for the competition. That feeling of being good enough to be recognized as being good enough, by various viewers and judges both within and outside Nigeria was enough reward for me. And this was all because decided to “grab lunch.” At the end of the day, I learned that sometimes in coming up with ideas, you need to take a step back, and look at the problem from different sides. Taking a step back sometimes is as simple as going out, meeting people, taking in the scenery. Here are a few places we’ve found that helps get us out of our creative rut. Precious loves art and designs. He strives to incorporate it in everything around him and is not shy about it. He also loves being stylish because "why not?" We are a design agency built from the desire to use our skills to improve the status quo. We use design to help companies create experiences for their customers that go beyond the regular, creating "wow" moments along the way.